With all the stress of daily life, environmental aggressor, lack of sleep it is hard to maintain the skin. With the passage of time signs of aging starts to appear on our skin. While we cannot avoid these factors, however; we can maintain a well-rounded skincare routine to reduce signs of aging, wrinkles and can tighten our skin. Sometimes Exercise and healthy eating are not enough to achieve such effects. Micro Needling Derma Pen comes with the help. Mesotherapy for skin is the use of micro tiny needles that stimulate the skin in a very short period of time. Our Micro Needling Derma Pen is an innovative device that enables precise, fractional micro-scaling of the skin with special needles, which provide a nourishing cocktail to its deep layers. As a result of this action, the natural processes of collagen formation are stimulated, the skin rejuvenates and firms, its quality is clearly improving, the coloring is unified, and stretch marks, scars and cellulite disappear. The amount of adipose tissue is reduced. The treatment - depending on the effect we want to achieve - takes from 15 to 45 minutes. With more than 200000 micro needle micropipe, allows your cosmetics to penetrate deep in the skin reducing wrinkle, improves collagen, anti cellulite,remove scar and other special effects starts to appear. This treatment is also beneficial to improve the eye wrinkles, dark circles, tighten and enhance the ideal effect of facial skin tissue. Step 1- Cleanse your face properly than remove access residue with wet towel. Step 3- Clean the face with wet towel. Step 6- Now apply Micro Needling Derma Pen for 15 to 45 Minutes. Step 7- Apply any Soothing Mask. 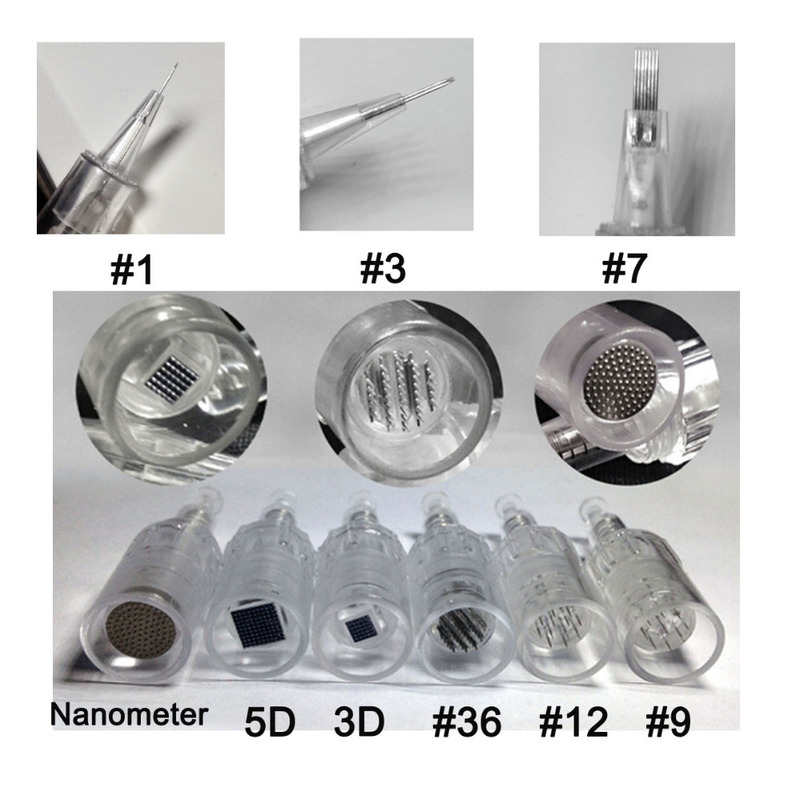 It Can take single needle, 1 pin, 3 needles, 5 needles, 7 needles, 9 needles, 12 needles, 36 needles, nanometer wafer, nanometer crystal multiple needles!